We are well over half way through the Farmer's Wife blocks in the Farmer's Wife Quilt Along and so we start this week with block 53, Lucy (p.212, letter p.75). There's a lot to to like in this block - I am definitely saving this design for future reference as it is one that I want to explore further. I combined a variety of piecing methods for the construction. For this block I rotary cut the half square triangles that make the corners of this 9-patch and I made them a little bigger than the book instructions. 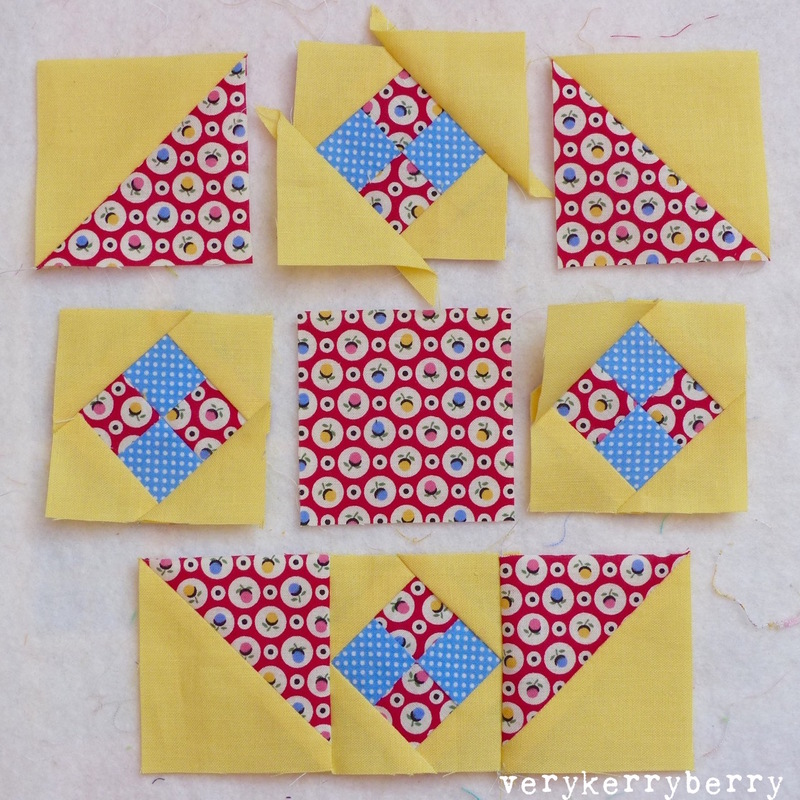 Then, once they were pieced together and the seams pressed open, I trimmed them to 2 ½" square. The centre square was rotary cut following the book. I foundation paper pieced the on-point 4-patch blocks adding larger triangles to the corners and trimming the whole square to size- like I did with the Lola block. In this picture you can see the different construction elements at various construction stages. Mix rotary cutting and piecing with foundation piecing. Press the final section seams open. Fiona of Poppy Makes is back this week to share her Farmer's Wife QAL block making experiences making block 54 Magnolia ( p.213, letter p.36). Her post will be up this evening. Here's my version, I am slightly wishing my floral fabric was a little darker for more contrast but ho hum. 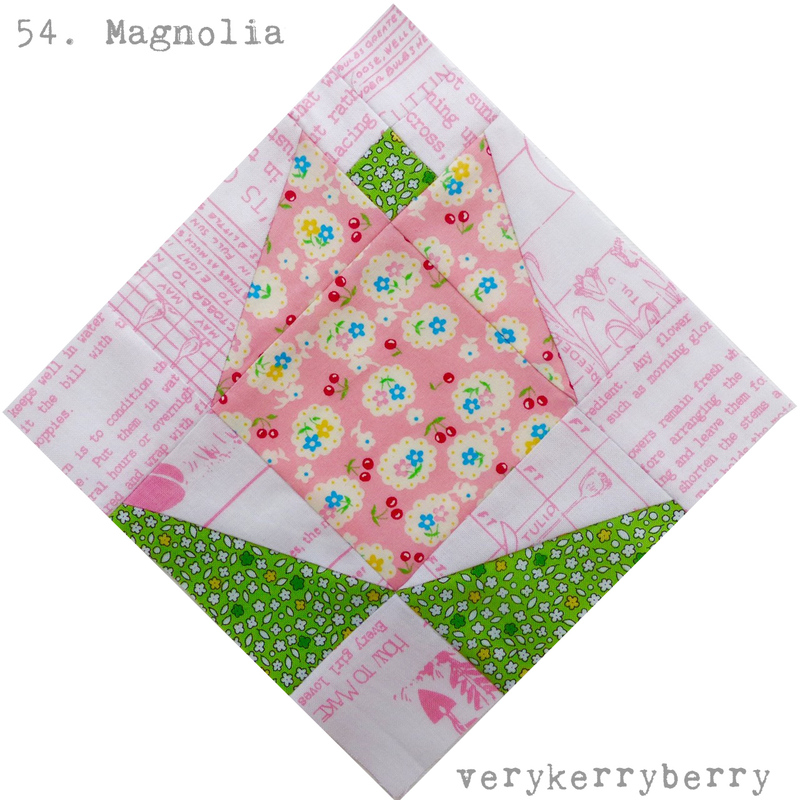 For individual blocks, you can use #Lucyblock and #Magnoliablock on Instagram, Fat Quarter Shop and Angie are using these hash tags, #fw53lucy, #fw54magnolia, I'm using both hashtag systems. You can also copy and paste links to any blog posts you do on these blocks in the comments or tag me on Instagram and I'd love to visit and take a look. Erica from Crafty Blossom returns as guest blogger next week. Thanks for continuing to do these informative posts Kerry. I'm lagging behind (a lot) but I know I will be returning to your posts in the future for construction details. Magnolia looks gorgeous! Thanks Julie! The posts will be waiting here for you!